American paddlefish, Polyodon spathula, are ancient relics living in modern times. They are the only extant species in the genus Polyodon. A unique species, paddlefish predate the dinosaurs, and have remained relatively unchanged for millions of years. They have been referred to as freshwater whales, but their most common names are spoonbill cat, and duckbill﻿. The Mississippi River drainage in the U.S., and the Yangtze River basin in China are the only two places in the world where paddlefish are found. The Chinese paddlefish, Psephurus gladius﻿, is a different species from the American paddlefish, and is believed to be near extinction. 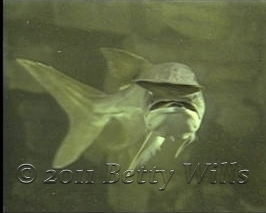 The last confirmed sighting of a Chinese paddlefish occurred on January 24, 2003. Historically, American paddlefish were widespread, and inhabited most of the large rivers of the Mississippi River drainage. But not any more. They have been extirpated from much of their peripheral range, to include the Great Lakes and Canada, New York, Maryland, and Pennsylvania, and there is growing concern about their populations in other states. See the FWS Sting Operation trailer at the Paddlefish Gallery. Also available in the Paddlefish Gallery is the opening segment of the documentary, The Paddlefish: An American Treasure, and an interview with the late Kim Graham, affectionately remembered as Mr. Paddlefish. Paddlefish are one of the largest freshwater fish in the United States. They can weigh over 180 lbs., and reach 6 ft. in length. Their name comes from their paddle-shaped rostrum which may be a third of their total body length. The exact purpose of the rostrum is still not fully understood by scientists and biologists. A popular theory is that it’s a balancing mechanism for swimming in strong currents, and also used as a sensory device to locate swarms of zoo plankton. Paddlefish are smooth skinned, and entirely cartilaginous with the exception of the dentary, or jawbone. Paddlefish are filter feeders with gill rakers that filter zooplankton from the water column. Three precise events must occur before paddlefish will spawn. The water temperature must be from 55 to 60 degrees Fahrenheit. The photo period which occurs in Spring must be just right. There must be a proper rise and flow in the river. Historically, paddlefish did not spawn every year because the events only occurred once every 4 or 5 years. Where and how paddlefish reproduce is still pretty much a mystery. Earthwave Society produced a comprehensive one-hour program documenting the biology and life history cycle of paddlefish. It was part of the Exotic & Unusual Fishes series that was broadcast on PBS and internationally. A full version is available at our DVD Gallery, and on YouTube. © 2004 Earthwave Society.. All rights reserved.